*This Specific Rake is Currently Only "Stocked" At the Endicott Store. 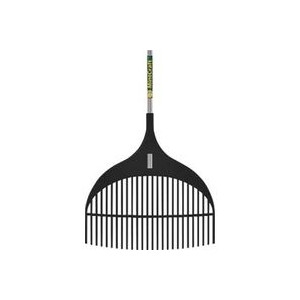 This Rake Features a Poly Head with 26 Tines situated on a 48 Inch, Wooden Handle with a 36 Inch-Cushioned Grip! This Leaf Rake features 22 Steel Tines and a 54 Inch Wooden Handle with a 6 Inch Cushioned Grip. It is ideal for use when weeding, leveling soil, and leaf collection. 22 Tine Poly Leaf Rake with 48 Inch Hardwood Handle. *This Rake is Currently Only "Stocked" at the Owego Store. Please Call Ahead to Check Availability. This Leaf Rake features 18 Steel Tines situated on a 48 Inch Wooden Handle. *This Specific Rake is Currently Only Available at the Owego Store. This Shrub Rake features an 8 Inch head and a 48" Wooden Handle. This rake makes clean up under shrubs and plants a breeze without killing your back or your knees! This Clog Free® rake is the first rake of its kind designed NOT to clog! It's patented wave shaped teeth prevent leaves from getting stuck! No more breaking your back trying to remove those unwanted leaves/debris from your yard! Why not choose a rake that will save you time and work! 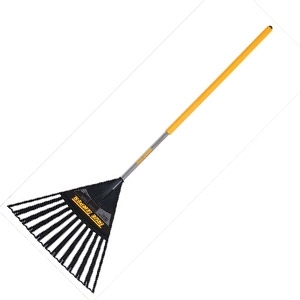 A poly leaf rake with a vinyl coated steel handle for added durability. The curved head design makes raking leaves easier!